However, Burr begrudgingly introduces James to Dolley—what with his being married and all, he really had no reason NOT to introduce them. James and Dolley then marry after a very brief courtship and Dolley must leave the Quaker faith because James in not one of them. And Aaron? 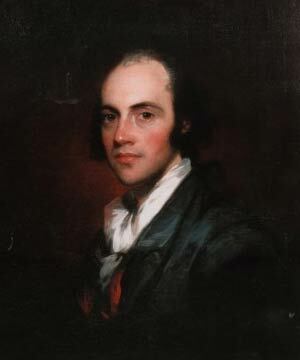 He goes on to become VP under Thomas Jefferson- then kills Alexander Hamilton in a duel. How is that for a few juicy storylines? Back to Dolley and James… he adopts John Payne and they never have any other children. He is it. And his life is another soap opera –one story arc after another, that John Payne. But James Madison? 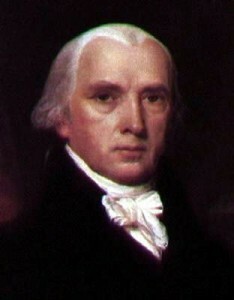 First he becomes Secretary of State under Thomas Jefferson. Jefferson is a widower, so Dolley is called up to act as hostess for certain Presidential events. And NOW our dear subject has found her true calling in life! She does an amazing job entertaining delegates, playing politics while NOT playing politics, and charming all of Washington. 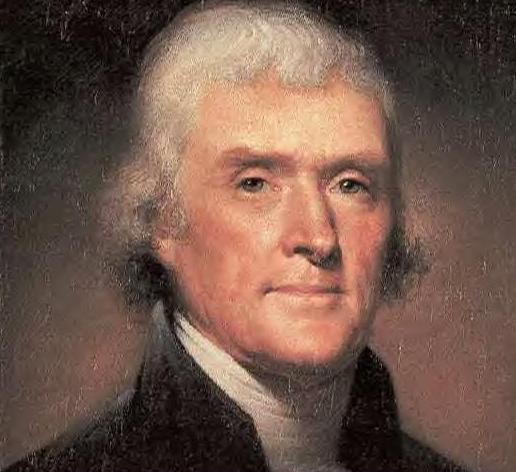 Because we have a thing for Thomas Jefferson and will never resist the urge to put up this portrait of him. 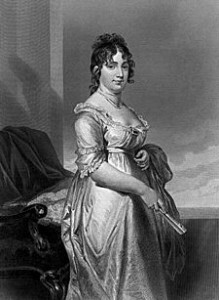 Her role continues as James Madison is elected the fourthPresident and Dolley moves into the White House. She defined the role of the wife of the president – she really was the hostess with the mostest. She proves time and again that she is a woman to not be messed with! As if that wasn’t enough she seals her patriotic cred by saving valuables, including a ginormous portrait of George Washington, as the British are burning her city including the White House. You can’t write drama like this! This is some really good stuff! And her clothes! This woman is a fashionista! She is setting trends, rocking turbans, sniffing her snuff- and we talked about all this in the podcast! You know us with the clothes…we kinda get excited. And, yes, since we like to tie past times to present times as often as we can, we compared her to Sarah Jessica Parker- another style icon who rocked some pretty far out fashions, too. A woman with a style all her own! Get it? Ok, maybe it's just us. James serves two terms as President, she serves many official dinners, is rumored to have had the first Easter Egg Hunt on an as yet unlandscaped White House lawn, and helps fund-raise for a couple of exploring dudes named Lewis and Clark. She is one busy woman! When James retires, they return to his family estate, Montpelier, in Virginia. By this time, John Payne has done a couple of stints in debtor’s prison and has some nasty drinking and gambling habits. When James dies, Dolley is left with the debt of John Payne and sells part of the estate to help keep her son out of debt. 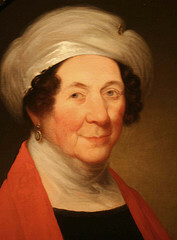 Dolley moved back to Washington in her old age and declining economic status, but she is STILL so widely liked that she is supported in part by those in her community. She sells Presidential papers to congress, and gets an honorary seat in Congress so that she can watch the proceedings. She advices several wives of Presidents who come after her, and even her last public appearance was at a Presidential dinner with James Polk. Remember, this is a woman who has held no elected office, but she is still such a part of the process that she continued to be included throughout her life. She died of unknown causes at age 81. 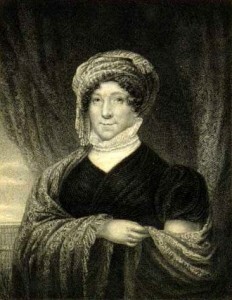 At her funeral, Zachery Taylor first used the term “First Lady”. She wrote the book on the position, it is fitting to us that the title is part of her legacy. In a yet one final soap opera worthy note, her son John Payne outlived her by only 2 years, and died of typhoid fever. But don’t close the book on this woman! Her hostessing is so legendary the Zinger company in the 1930’s will name a snack cake line after her….even if they spelled her name wrong. Silver patterns are named for her, and her name is synonymous with entertaining to this day! If we got you excited to learn even more about this woman, or if you were already fascinated by her, tell us about your experience! Does she make you want to have your dual hankies (one for the rough work, and one for polishing)? 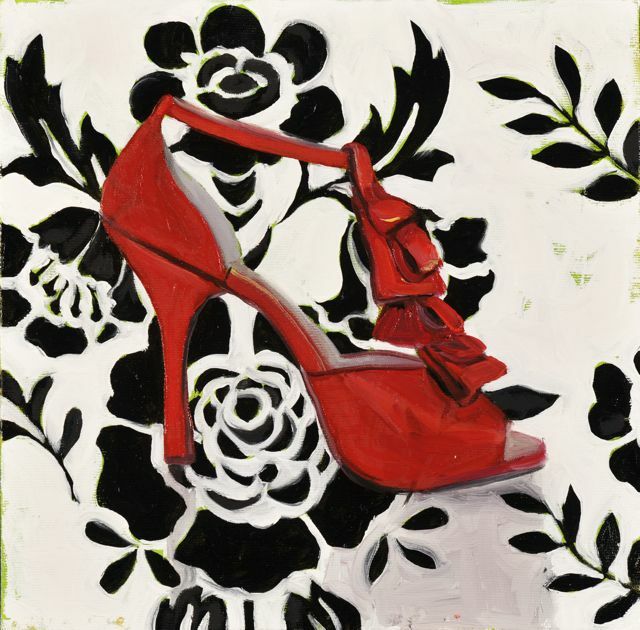 Or maybe just give you a desire to wear a really rockin’ hat or wallpaper a room in red flocked paper? As for us, we are going to polish our silver and raise our crystal goblets to toast the legacy and memory of this extraordinary woman! I’m really enjoying the podcast. Lots of tidbits I’ve never heard before. Keep it up! Ooooooo! 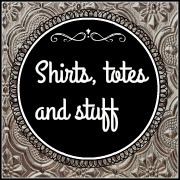 I added this link to the blogroll. Many, many thanks!